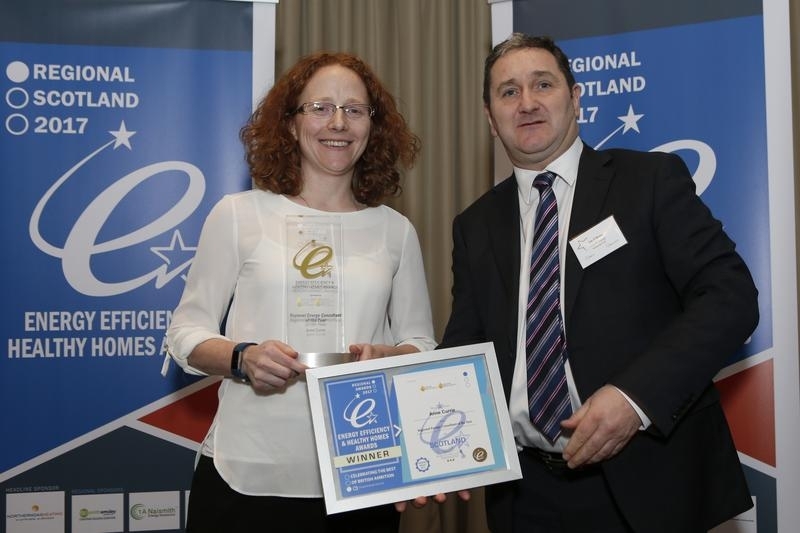 The 2017 Regional Energy Consultant / Consultancy of the Year Award rewards one exceptional individual or company, in each of the 11 Regional areas around the UK, that advises businesses or homeowners about energy efficiency savings and measures through a Green Deal of EPC energy assessment. This award recognises the efforts of a fully qualified energy assessor that provides excellent customer service, and demonstrates a high standard of assessment and best practice within their local community. 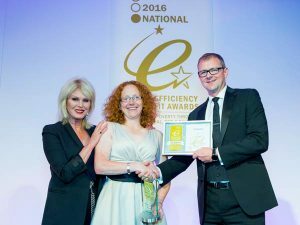 Anne Currie, of chartered building surveyors company the Smith Emsley Partnership, picked up the advisor of the year award at the recent UK National Energy Efficiency Awards. 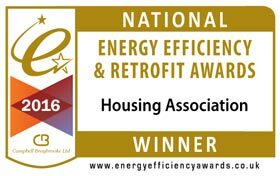 Anne Currie, on behalf of chartered building surveyors company the Smith Emsley Partnership and in conjunction with Dunedin Canmore Housing Association picked up the Housing Association of the year award at the recent UK National Energy Efficiency Awards. we have received from our satisfied customers. Can’t rate the service of this company highly enough, phoned many of the numbers I was given and no one wanted to travel to my location, Anne agreed to come and was like a breath of fresh air, did the survey and emailed the report to green deal and myself that afternoon. Very professional service. I contacted Bernadette about getting an appointment to do a Green Deal Assessment Report…. …Bernadette was very knowledgeable and professional throughout the entire process and I would have no hesitation in recommending the Smith Emsley Partnership Ltd to anyone. I would like to express my gratitude to The Smith Emsley Partnership for their faultless service over the last two years. They provide a highly professional service at all times whilst remaining friendly and personable which I believe is the perfect combination for a successful business. They are always contactable and carry out all surveys quickly and efficiently. We have known Anne Smith and Bernadette Smith from Smith Emsley Partnership for the last two years, having used them on a number of our properties. We have always found them to be professional, reliable and couteous with clients. I would therefore have no hesitation in recommending Anne and Bernadette to future prospective customers. Blackwood Homes and Care approached Anne Smith in November 2015 with a view to completing the mammoth task of inputting EPC data for over 1100 properties within our housing stock. Anne took this task in her stride and we were extremely impressed with her professional and approachable nature – it was a pleasure working with her. Two months later we now have energy performance data for the majority of our properties which has helped us as an organisation, to not only understand the investment required in our assets to meet the Energy Efficiency Standard for Social Housing 2020 target, but also tailor our planned maintenance programmes to ensure affordable warmth for our customers. I needed a Green Deal report to support my HEEPS loan application and went on to Green Deal Orb to find local assessors to do the report. Of 5 suggested I asked 3 if they were interested in doing my survey – only Smith Emsley could come on a day that suited me, and they offered the best value too. The service was very friendly and helpful, quick and efficient, and the report was issued later the same day! Fantastic – thank you. Would recommend to anyone.